Nothing is ever straightforward with the WBA and WBO heavyweight champion, it seems. Wladimir Klitschko poses with an image of Tyson Fury, who failed to turn up for a media conference. TYSON FURY FAILED to show up for a media conference with Wladimir Klitschko ahead of their world heavyweight title rematch on 29 October citing a broken down car for his no-show. Fury was initially scheduled to defend the WBA and WBO belts he took off Klitschko in Dusseldorf last November on 9 July but cancelled the bout after spraining his ankle. Although the date has now been rescheduled, the 28-year-old failed to make a media event in Manchester today after the vehicle he was travelling in broke down en route to the venue. Fury’s manager Mick Hennessey denied it was a planned stunt, saying: “Apologies for Tyson not attending. All we know at this stage, because his [phone] battery is dead, is that he’s had problems with traffic and the car he was in broke down. The heavyweight champion’s trainer and uncle, Peter Fury, was present and is anticipating a far more exciting spectacle between the two fighters the second time around. “This will be a different fight to the last one because Wladimir knows he has to do things differently. Tyson knows he has to do things differently to accommodate what’s coming at him. That’s why this is a lot more interesting,” he said. Klitschko previously threatened to take Fury to court following the delay to the fight, while further controversy followed with the Brit facing a UK Anti-Doping hearing in November after being charged for an alleged drugs violation. The 40-year-old is hopeful the pair will be able to get in the ring soon and insisted he will not look for a fight elsewhere if further scheduling issues surface. 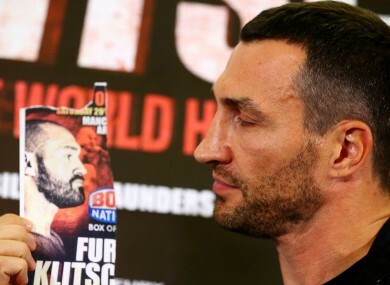 “Fury’s not here right now — maybe he’s invisible — but hopefully soon we will meet in the ring,” said Klitschko. “I can wait, I have enough patience. “I’m looking forward to this fight and I hope eventually we will meet in the ring. We want to show to the public that the fight is for real. If it doesn’t happen in October, I will wait. Email “Fury stands up Klitschko at press conference after car breaks down”. Feedback on “Fury stands up Klitschko at press conference after car breaks down”.